Our final module for the BA Creative Writing was a publishing project and our task – to create three new literary journals (44 Square: Fiction, 45 Square Poetry and 46 Square: Creative Non-Fiction) with work submitted from all four years of the Birkbeck BA Creative Writing Programme. I was Editor of 44 Square Fiction and, as group projects go, it was a surprisingly pleasant experience. We generally agreed on most things, from selection of pieces to the front cover design, so our meetings were relatively stress-free. We were fortunate to have a number of illustrators in the group so we were able to supplement the writing with some lovely line drawings. The most difficult part, I thought, was the final proofreading and copyediting. It seemed that no matter how many times I read a piece I would find (or worse, miss) errors and typos. I’ve always thought I had quite a good eye for typos but it was a much more painstaking job than I was prepared for. My favourite part of the process was the production of the print journal. We were only required to produce an eBook, but our editorial team decided to produce a limited number of print editions and I particularly enjoyed this. It was very satisfying to have a physical souvenier of all of our hard work to keep at the end of the process, and to present to our contributors and teachers. The final publications were launched on the 4th of June at Stratford Circus. 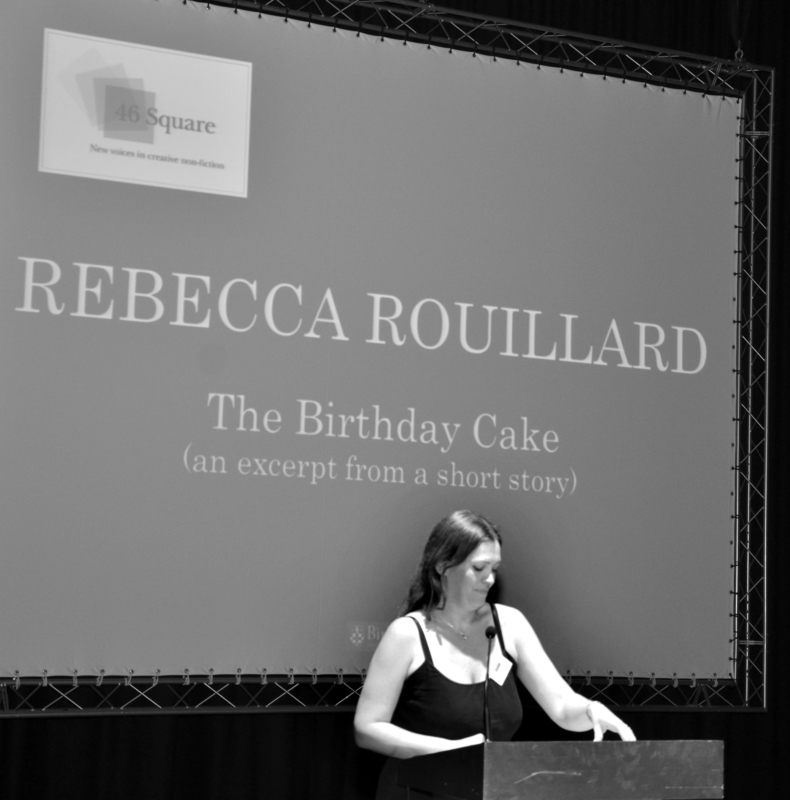 I was fortunate to have had my submissions selected for 45 Square and 46 Square and I was also asked to read an excerpt from my creative non-fiction piece, ‘The Birthday Cake’. The publicity team did a wonderful job of organising the launch and it was an enjoyable evening.